At least get a different message to be displayed. Edited by Spurtung, 18 September 2017 - 01:44 PM. Good thing they always inform about such things on their twitter account. I hope some people at least feel stupid now that they buy every single premium tank there is but at this point get "scheduled maintenance" every single day at the weirdest points of time. Then again how much WG is to blame for that, we dont know. They most certainly dont use their own server but rent them from a third party company (there are only very few of these left). If that third party has a problem there is hardly anything WG can do to fix that. Actually I just get message that there was a restart of the servers. God knows what that does mean, besides the obvious. Edited by WunderWurst, 18 September 2017 - 01:49 PM. It's the default message, and will be the reason regardless. Would you be less mad if they said "Hamster died" or "Crashed for unknown reasons, it's up when it's up"? Well to be fair, most "scheduled maintenance" this patch so far was actually pre announced in the garage. It's just that not to many do notice it when they use the notification center and rage about it as a sever crash. Tho last night we know the hamster died, as we all lost the last two matches, along with their XP etc. And I suspect it did now to, as there is no announcement for it. So might be the same issue... what ever it is. Edited by Balc0ra, 18 September 2017 - 01:54 PM. I really would, as there's nothing scheduled about what just happened. Maybe its preparation for start of Ranked battles today , 18.00 CEST , EU1. For me this one disconnected after the game was concluded so it could have been an ordered shut down. If it was, they would announce it somewhere as pr the norm. But nothing. Edited by Mike_Mckay, 18 September 2017 - 02:07 PM. Got amazing battle log for the last game before crash, it switched friendly and enemy team. 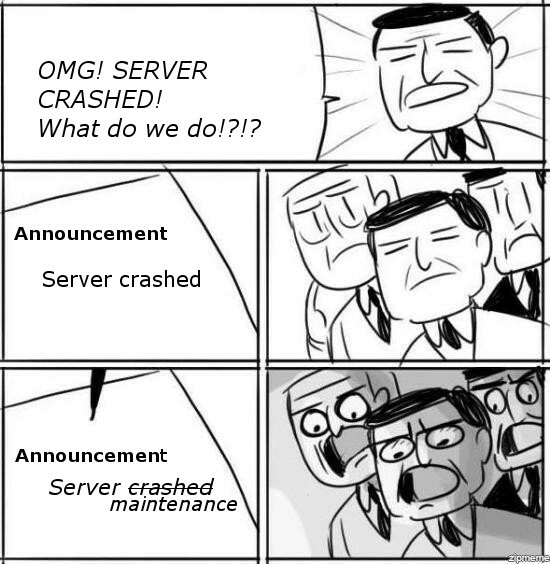 there is no reason to panic, servers didn't crash. EU1 had to undergo a very brief maintenance to implement changes needed before Ranked Battles start later today. This was needed to prevent some issues with MM in RB your fellow tankers reported on RU server. To deliver the best experience to you before season starts we decided to do the fix as soon as possible, which unfortunately meant it happened during the day. The World of Tanks EU1 server will be unavailable on 18.09.2017 from 14:40 – 15:00 CEST due to this update. How [edited]hard was that to announce BEFORE server downtime? You amaze me every time. 10/10 would fire your asses. There's no panic at all. What you're doing here should be announced in the portal. If it was indeed scheduled, the least you can do is not to be lazy about it and announce it before it happens, not after, not only when asked about it, and not only on the forums. I thought you were working on your communication skills as a company, but this kind of thing shows very clearly you're not even trying any of that, by constantly missing every chance you get for doing so. I assure you that wasn't there when I created this topic.